Talking Adelaide is just a tad obsessed with Aimee Leduc, the detective heroine in Cara Black's Paris-based crime series, in which each book is set in a different arrondissement of the French capital. 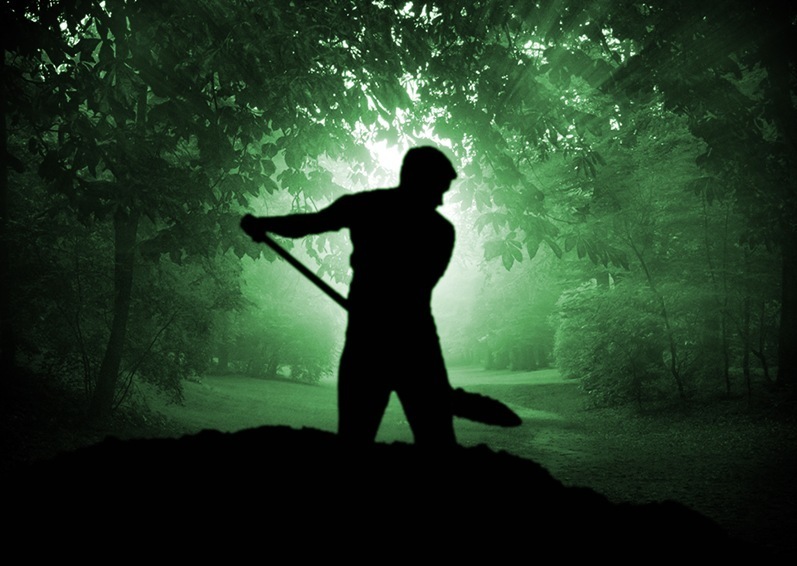 So it was with interest TA received details of the inaugural The Body in the Garden, a crime and garden writers’ festival in Adelaide Botanic Garden this weekend. Hilarious. Mixing garden writing with crime. Love it. BTW check out Talking Adelaide's spring roses. These are St Jude the Obscure and there are so many buds (you can seem in the background) in TA's garden that it's going to smell like Guerlain's perfume factory this spring-summer. This David Austin variety was chosen because of its scent and heavy head of petals. But back to the writing festival. It's organised by Rose Wight and Penelope Curtin, experienced arts, literary and festival practitioners in Adelaide. TA is a fan of UK actress Brenda Blethyn's work as English detective Vera Stanhope in the TV series and Vera's creator Anne Cleeves is on the program; she is joined by Toby Musgrave, one of the UK’s leading authorities in garden history and design; Hakan Nesser, winner of the European Crime Fiction Star Award and three-time winner of the Best Swedish Crime Novel Award and British garden writer Charles Elliott. One of Talking Adelaide's favourite Sunday outings is an afternoon concert in the gorgeous Elder Hall, North Tce. About five times a year, one of Australia's top pianists, Kathryn Selby, comes to town for an afternoon of brilliant chamber music accompanied by two or three other young musicians, all at the top of the games. For a couple of years, the concerts were by Trioz, which included Adelaide violinist Niki Vasilakis. It is a relaxed couple of hours; each time it seriously feels like you are catching up with old friends. Selby, or one of her players, doesn't hesitate to address the audience before each piece to explain its origins and why it fits in with the program's theme. This is no intimidating, snobby classical music event. It is a casual afternoon of invigorating music by musicians at their peak. The applause is hearty and appreciative. And at half-time there is Adelaide's best afternoon tea to be had: home-made cup cakes, slices and biscuits, with the left-overs snapped up on trays by the departing audience. It all goes to a good cause too. Selby&Friends' 2014 program is out and it includes an array of big names (Mozart, Brahms, Schubert, Debussy, Tchaikovsky) including a whole afternoon in May devoted to a Talking Adelaide fave, Beethoven. It also names Selby's guest artists. You can check out the program here. A subscription to the concerts before November 1 saves 20% - essentially 5 concerts for the price of 4. And the next concert is Sunday, September 29 - perfect, gentle afternoon after a big Grand Final Saturday. Check out Selby&Friends' 2014 program. Link above. Putting yourself out there in public, exposing your previously private hobby, passion or activity to scrutiny can be intimidating. It takes guts. Requires support. Not to mention a dose of talent. It also takes an investment of time. It’s SALA Festival month, and all over Adelaide there are people who are risking their reputation, prepared to give it a go by hanging their artwork up in all sorts of spaces to be judged by the rest of us. Talking Adelaide is full of admiration. One such person is Suzi Ting, a trained artist (Adelaide Central School of Art) and former high school visual arts teacher who now works as a stylist and producer alongside her husband, photographer Randy Larcombe. Suzi’s been aspiring to hold a SALA exhibition for some time and this year waited until the last day to shut her eyes, hit “send” and lodge her online entry. With Randy’s support, she got seven pictures finished and called them Collected. 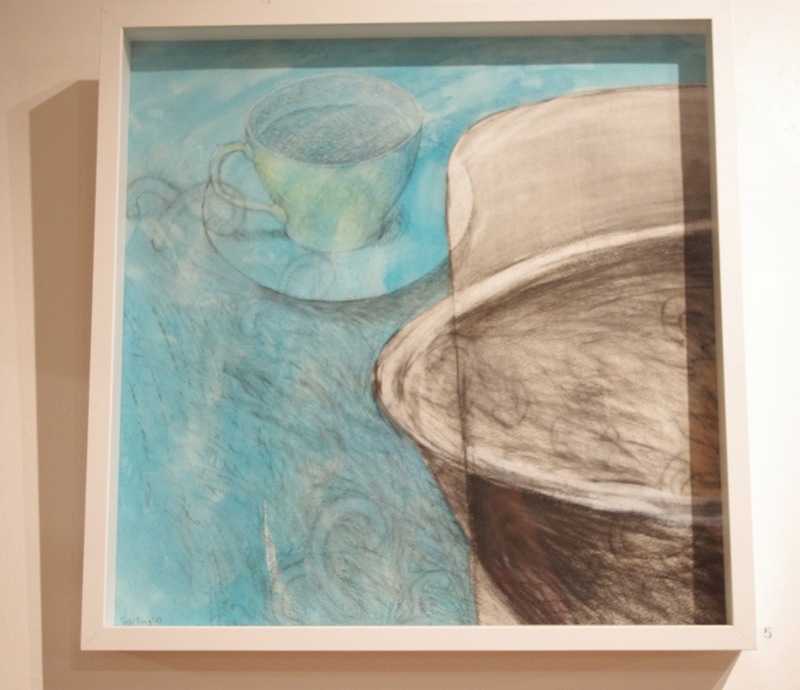 They’re gorgeous, pastel-coloured, layered drawings, charcoal is the main media. 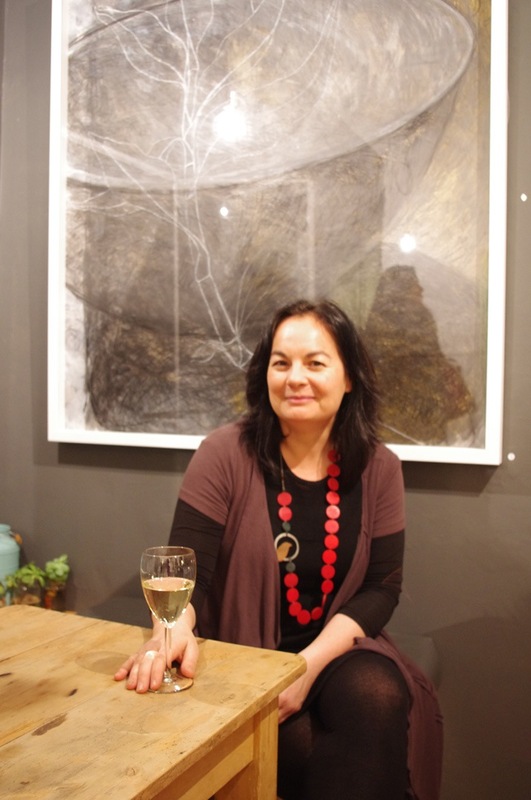 “In between, I use layers of acryclic both thick and thin, like water colour, sometimes shellac or collaged found papers or printed papers, “ Suzi explains. The subjects are seemingly inspired by Suzi’s domestic life. “I am a bit of a collector; of recipes, crockery, kitchen objects, and interesting ingredients, also natural objects like seedpods, shark eggs and nests," she says. 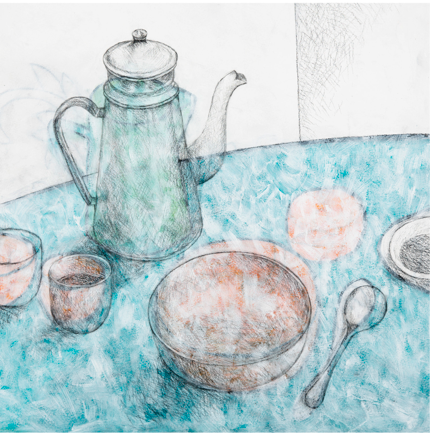 “Food memories often appear in my work for example the crockery I inherited from both grandmothers speak also of the moments we were brought together over shared meals. My father is Malaysian Chinese and I've always been interested in the difference in the approach to food between my Chinese side of the family and the anglo side. 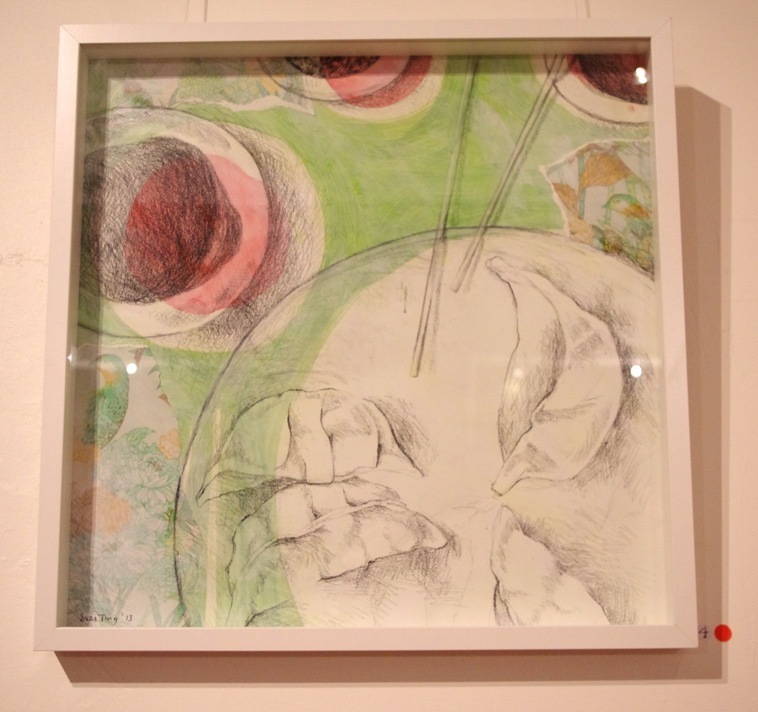 The titles of the drawings include: memories of laksa; a bowl of comfort; the art of tea; feeling wonton; nanna’s cup, grandma’s bowl; rock, scissors paper; and spilling beans. “My creative background has been as a secondary art teacher and now photographic producer and stylist. I've always loved making things or helping others tap into their creative side,” Suzi says. 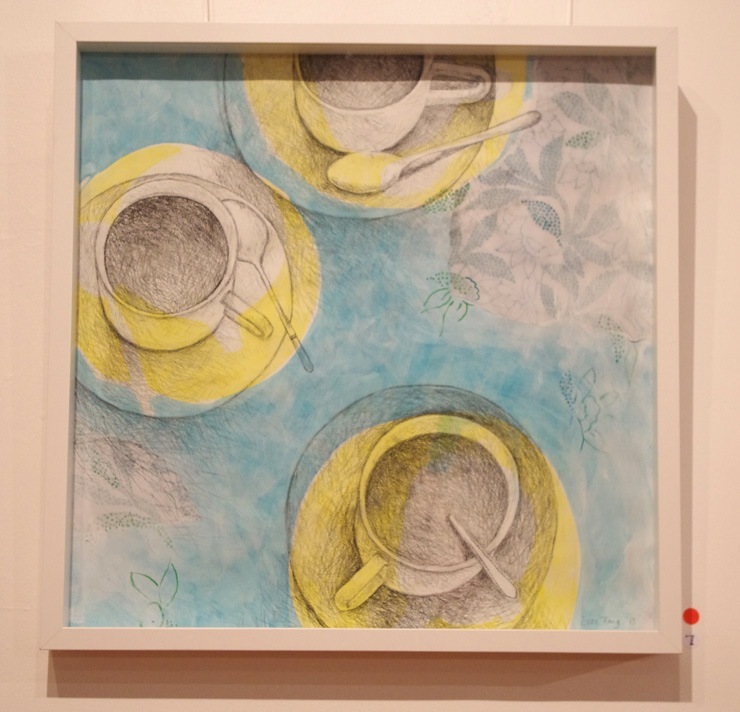 “Juggling this with a young family has led to me getting back to basics with drawing, though I have worked with printmaking, ceramics and painting in the past. If you want to see Suzi at work and talking first hand about the process and her motivation - watch this great video below by Randy (click on the caption). Suzi Ting - making her mark. Suzi’s work is hanging in the popular café The Stranded Store, on The Strand, in Colonel Light Gardens, until the end of August. And there’s already a few red dots alongside them. Get out there and look at some SALA work this month – and admire not just the skill on show but the courage too. Cover art of Lance Campbell and Mick Bradley's book chronicling the changing streetscapes of Adelaide. Anyone who knows Talking Adelaide knows TA has a passion for the Art Deco period. This has manifested itself over the years in purchases and gifts of furniture, homewares (lamps, bookcase, drinks trolley), glassware, assorted Bakelite bits and pieces, even Chez Wayville was built in the period. So it is with much pleasure to promote an event organized by the Art Deco & Modernism Society of SA this Sunday afternoon (July 28) at La Boheme, in Grote St. The society is publicising City Streets – the wonderful book by writer Lance Campbell and photographer Mick Bradley that celebrates the streetscape of our town in words and pictures by the authors themselves. In 1936, when South Australia was 100 years old, photographer Gustav Hermann Baring took the streets to capture the state and its capital in images. His huge publication, Progressive Adelaide – As it Stands Today “was both a catalogue of commerce and a labour of love”. Inspired by that book, Campbell and Bradley set out in Baring’s footsteps to capture the city’s progression. The even this Sunday will include a performance of Memories of Australia, a song in the book that was recently revived at a City Streets presentation in the Barossa. Starting at 3pm, tickets are just $20, which will go towards the Deco Society’s fighting fund to “help save 20th century Adelaide”. If you feel like coming along, email alison.oloughlin@gmail.com or phone 0408850234. Wakefield Press will have books for sale including City Streets, which Campbell describes as “a brass-bottomed, copper-plated, silver-lined, gold-embossed local bestseller of which everyone involved is very proud”. This Sunday afternoon in Adelaide sees the performance of a dead-set Oz rock legend. My mate Chris Crago, a fellow Cancerian, has brought guitarist Ross Hannaford over from Melbourne to play a gig for her birthday. The private party is on Saturday but Sunday arvo is an open gig for just $15 at the door. That's not much coin to see true rock royalty. Fellow Seventies kids probably remember their parents grooving to Eagle Rock by Daddy Cool, the band Hannaford formed with mate Ross Wilson. While Wilson was out the front, you’d remember Hannaford to the side in his kooky helicopter cap. And if you ever spent time in Melbourne and headed to the Espy Hotel, on the St Kilda foreshore, before it became synonymous with RocKwiz, you might have caught Hannaford’s later band Dianna Kiss, which had a regular gig there in the 1990s. There’s no excuse not to head to the Gaslight Tavern, 36 Chief St, Brompton, 3pm-6pm. You can even catch the tram. You can grab a bite at the Gaslight – it’s old-fashioned pub grub. Check out the menu here. Check out the gig poster Chris designed below. Or why not grab a bite to eat at Plant 13 first? 13 Park Tce, Bowden; Or head to Suzy Wong’s Room afterwards? 120 Port Rd, Hindmarsh. They're both within walking distance.